Hero Xpulse 200 is going to launch soon in India. We expect that the dual-purpose bike will get more features than Xtreme 200R. Finally, Hero Motocorp will launch its upcoming adventure bike. Xpulse 200 is scheduled to launch soon. It replaces the Hero Impulse, which was their earlier try at the ADV bike segment. Hero Xpulse 200 was showcased at the 2018 Auto Expo alongside Xtreme 200R. This year, it was showcased at the EICMA 2018 alongside Xpulse 200T. The latter is a touring motorcycle, based on the same platform. Xpulse 200 uses the same engine and chassis that comes on Xtreme 200R. However, some cycle parts used are different from Xtreme. The ADV bike uses longer travel telescopic forks at the front and 10-step adjustable gas-charged Mono-Shock Suspension. Also Read: Hero Xpulse 200 Vs Hero Impulse – How is it better? Based on the showcased Hero Xpulse 200, it will get more premium features than Xtreme 200R. Actually, Xpulse will be the most feature-laden motorcycle from Hero. In terms of safety, it might get a dual-channel ABS setup, which can be disabled. Xtreme 200R gets a single-channel ABS. Hero Xpulse 200 and Xtreme 200R share the same engine setup. 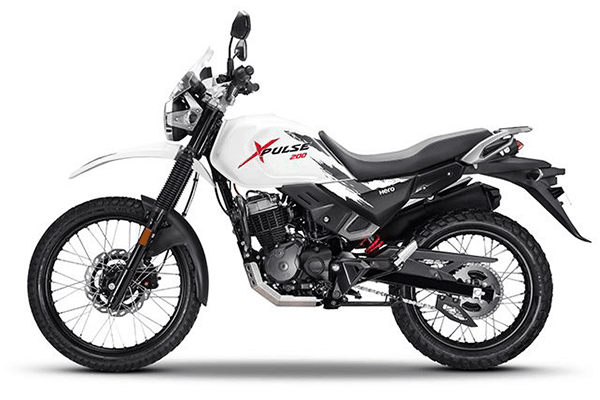 Xpulse gets a 199.5cc air-cooled engine that puts out 18 BHP and 17 Nm of peak torque. The engine is mated to a 6-speed gearbox, unlike Xtreme which uses a 5-speed unit. The engine might be tuned for better low-rev performance since it is an adventure bike. We expect the mileage figures to stand at 40 kmpl, delivering a total riding range of more than 400 kms. As per our expectations, Xpulse 200 will cost a little more than Xtreme 200R. The price estimation for the bike is around Rs 1.1 Lakhs (ex-showroom).